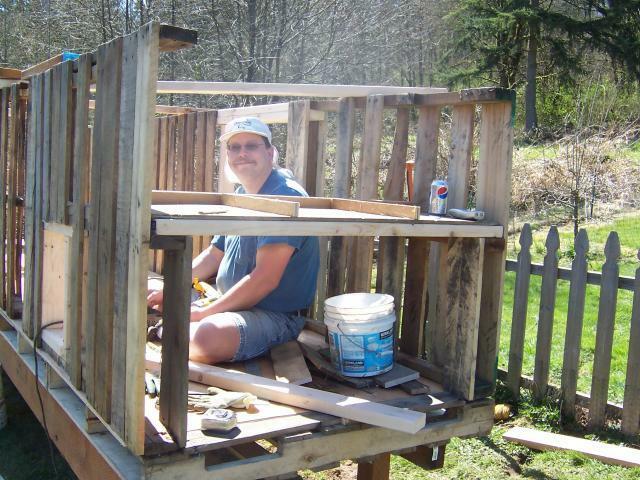 Our Pallet Coop we built in the spring of 2008. 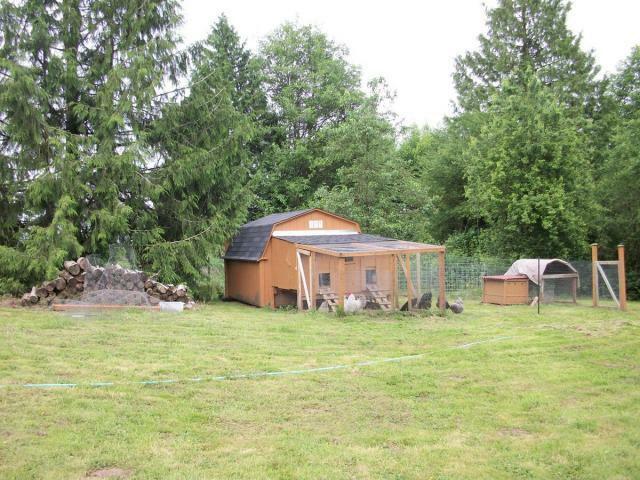 It is approximately 4' w x 18' long, with two seperate coops (each approximately 9' long) as it's divided down the middle. 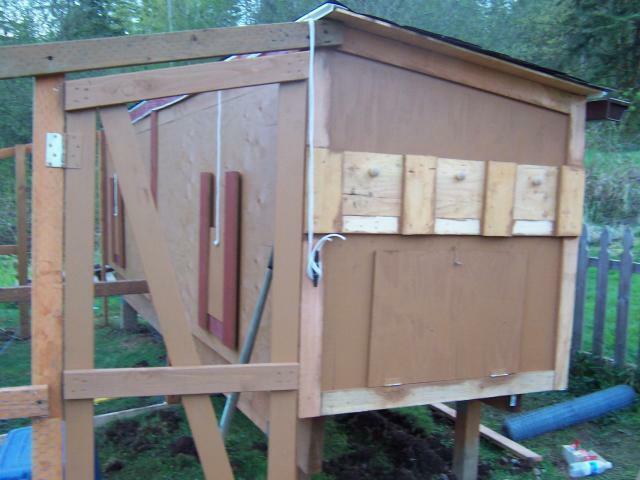 Each side is a mirror copy of the other, except for the outdoor runs, which were built around an older smaller raised coop. In the photo above, we turned the pallets on the right side sideways so they were not as tall as the pallets standing upright on the left side. The pallets run continuous on the left side, and the pop doors will be cut out later. On the right side, we left a large enough opening for the man doors in both coops, for easy cleaning. 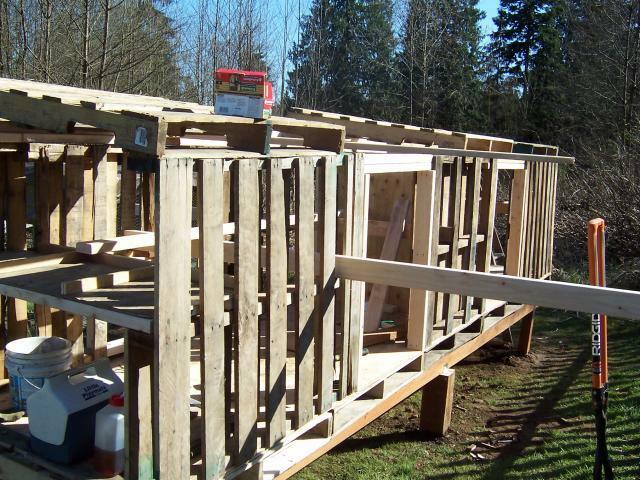 Above, DH is busy framing out the pop door and the nesting boxes. 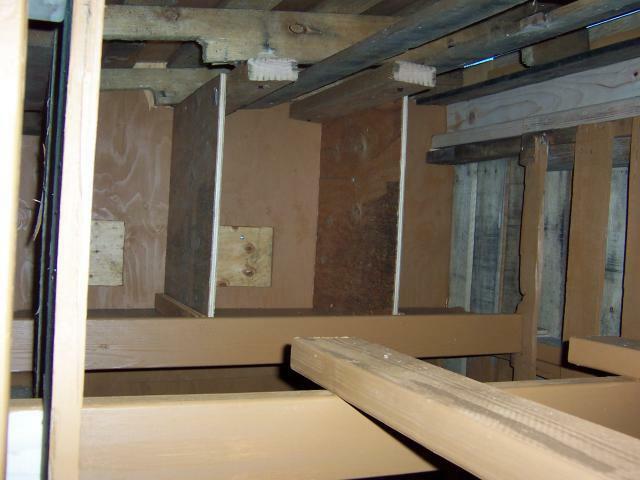 Each end will have 3 nest boxes and the feeder and waterer will go directly below them, with an easy access door on the end wall. 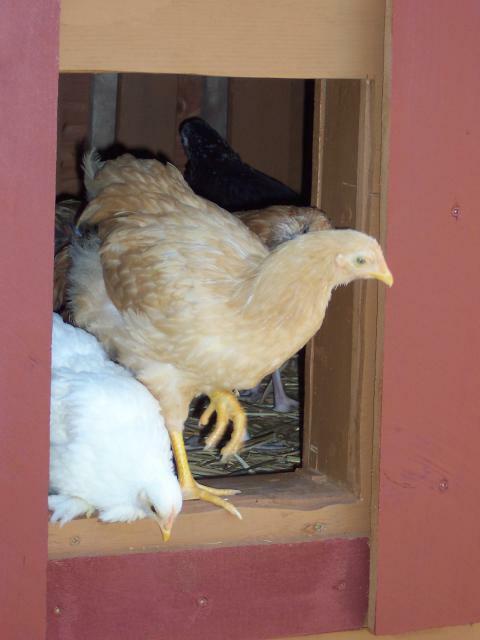 This is duplicated at the far end in the second coop area. 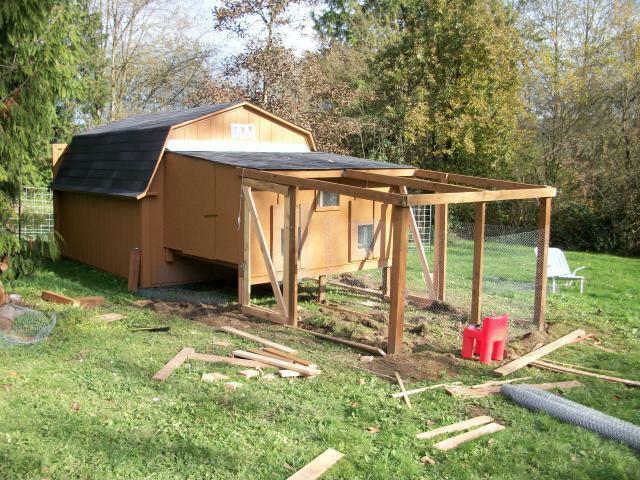 Above you can see the roof pallets in place and the two man doors framed out. Above you can see the access door for the feeder & waterer, the 3 sliding egg doors above, and the pop door on a pulley system on the left. 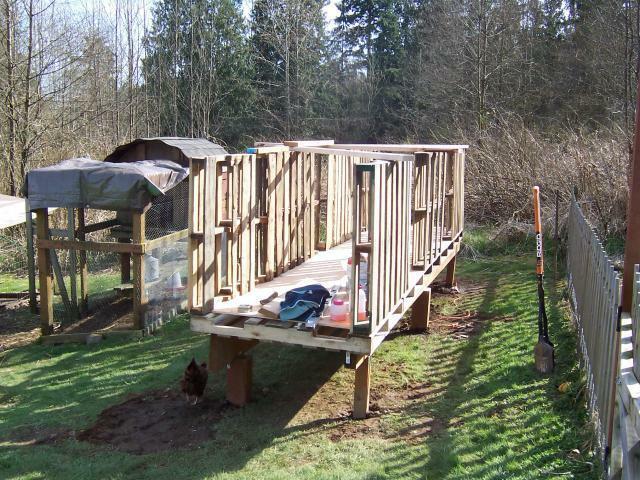 You can see the 3 next boxes framed out, then there is about an 18-24" gap, and then we put two 2x4 roosts down the length of the coop. The 18-24" gap is right over the pop door and allow the birds to fly up to the nesting boxes without banging their head on their roosts. The girls checking out their new digs! A couple of shots of it completed! Oh, and we put a gutter down the lower side, so that rubbermaid bin is collecting rain water from the roof. 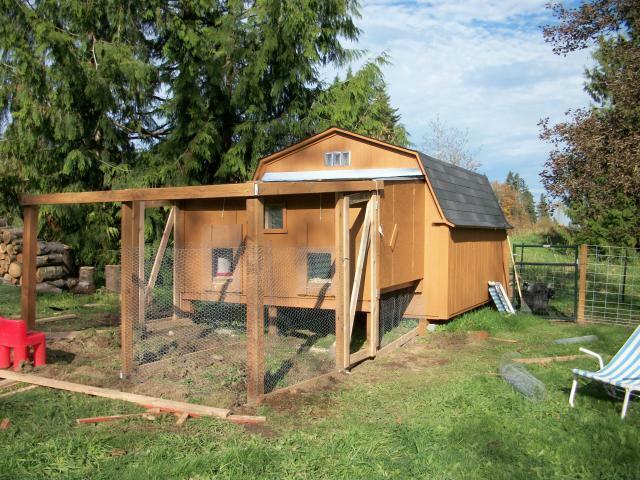 A follow up: We liked this coop design so much, we decided to follow the same design principles when we needed to build another duplex coop off the back of our new goat shed, however, we didn't use pallets this time. 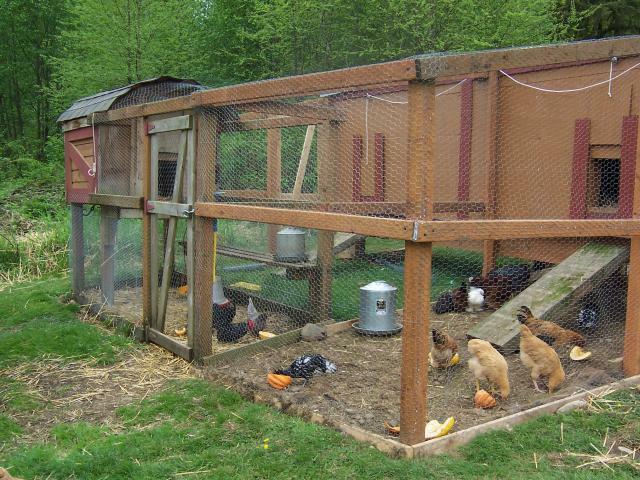 Just thought I'd post pics of this coop too. It is 8' wide, and 6' deep and also divided down the middle to make two seperate breeding pens. This is the whole Orpington Compound area as it sits now. 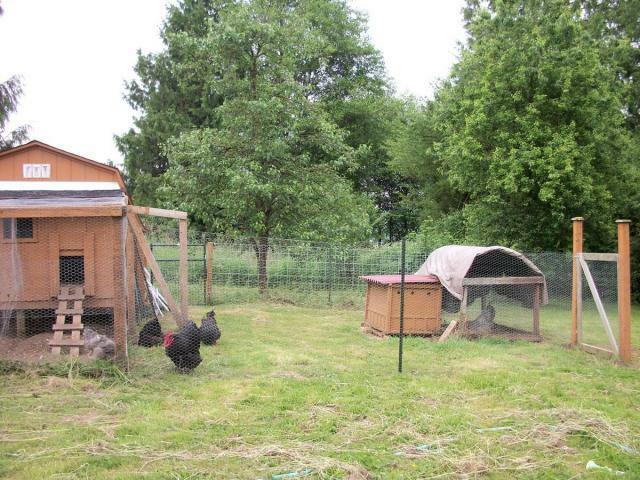 When we fence off an area to the left in front of the woodpile, we will also be adding a small coop for our Serama's on the left side of this area. "looks great-wish there were more pics!!" 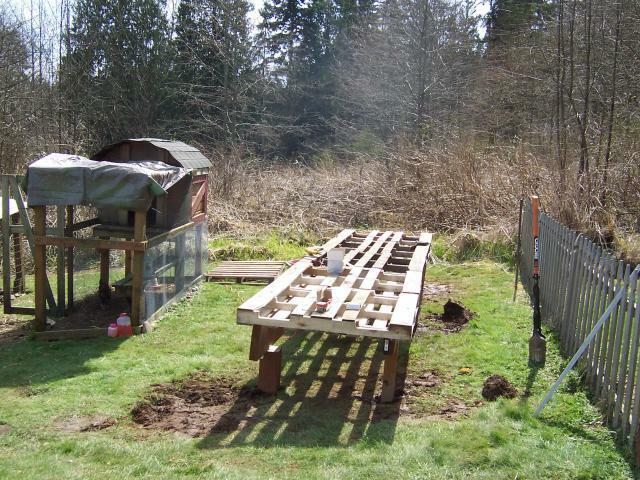 "Awesome use for the pallets!" Awesome job you cant even tell they are pallets. Love the dog house too! great use of pallets! 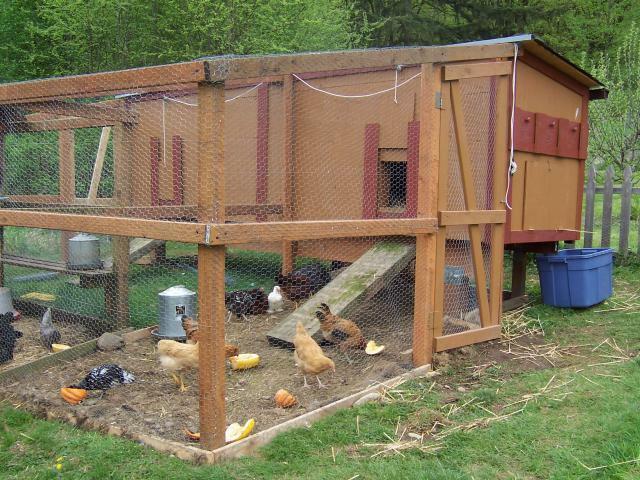 We used them for one of our coops too! cant beat the price if your willin to work!